A 20-feet ladder leaning against a wall is sliding down in a way that the angle of inclination is decreasing at a rate of 0.1 rad/min. So how fast is the area enclosed by the ladder, the wall and the ground going decreasing when the inclination angle is 30 degree? 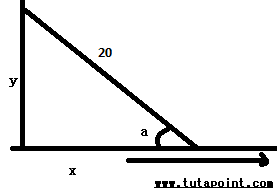 However, x and y are unknown, so we have to convert it to something related to the angle a. So the area enclosed by the ladder, the wall and the ground going decreasing when the inclination angle is 30 degree is 10 ft2/sec away from the wall.